While Special Forces soldiers train local militaries to push back against extremist groups in Central Africa, there are four small teams of civil affairs soldiers focused on winning the people's hearts and minds. Teams from the 82nd Civil Affairs Battalion, based at Fort Stewart, Georgia, are several months into rotations in both Niger and Cameroon, spending time with locals to figure out what they need to improve their quality of life — and, ultimately, what will keep them from falling under the spell of Boko Haram. That benefits both the people of those countries as well as the U.S., according to officials, as the group — which refers to itself as the Islamic State West Africa Province — colludes more and more with the Islamic State to the north. "Boko Haram is a locally generated violent extremist group that in recent times has become affiliated with ISIL," Col. Michael Zinno, U.S. Army Africa's civil military operations director, told Army Times in a Feb. 2 phone interview. "And now, not only is it affiliated, we're starting to see outright cooperation in that arena." The Lake Chad Basin region, which shares borders with Chad, Nigeria, Niger and Cameroon, is also deeply divided ideologically, into Christians versus Muslims, Zinno said. "In recent years, that Muslim divide has turned into fertile ground for development of an extremist message in the region," he said. "What started out as kind of a local nuisance for Nigeria has turned into a regional problem." To tamp down on it, the Army has deployed Green Berets to train local troops on how to combat Boko Haram. The Army has also based unmanned aerial vehicles in the region to help troops collect intelligence. "Our Nigerien and Cameroonian partners operate various types of aircraft out of their bases in Agadez and Garoua," said Lt. Col. Armando Hernandez, a spokesman for U.S. Army Africa. "The U.S is supporting their counter-Boko Haram operations with unarmed aircraft that provide intelligence, surveillance and reconnaissance support." The other part of the equation is supporting the U.S. State Department by engaging with locals, finding out what they need to improve their social and economic situations, and figuring out a way to help them. "The people in Niger, they’re really welcoming," Capt. Deandre McDonald, head of Civil Affairs Team 8241, told Army Times. "It was really a transition from the mindset of Iraq and Afghanistan with the local populace." 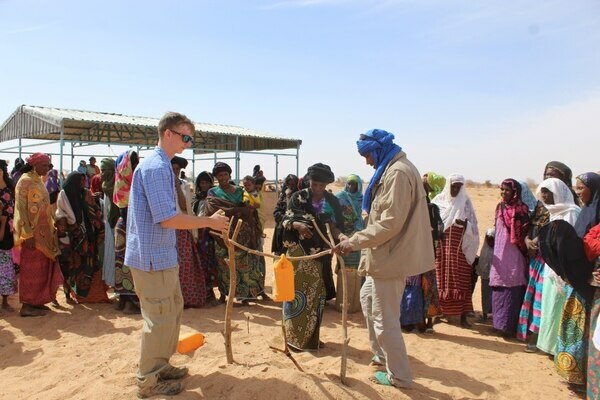 Members of U.S. Army Civil Affairs Team 8241 display a simple and portable hand washing station made from local materials during a visit with villagers in Tsakatellum, Niger, Jan. 9, 2017. The team and members of the 724th Expeditionary Air Base Squadron conducted the engagement as part of the ongoing effort to reduce Boko Haram's ability to recruit and influence vulnerable populations in the Lake Chad Basin. McDonald and his team touched down in Niger back in September, picking up where another team in the same battalion left off. "West Africans are really excited to work with Americans, work alongside us, meet us, talk to us, and just sit down and spend some time with us," he said. The teams are also on their own as far as security, McDonald added. "There is a threat, but we have not been directly targeted by [violent extremist organization] groups," he said. But there has been some anti-American messaging spread on social media, he added. Teams are meant to spend between four and six months on the assignment, Zinno said, but can go up to nine. McDonald's four-person team includes a sergeant first class, staff sergeant and a specialist medic, who work with the local government on their projects. One of their first was a vaccination drive soon after they arrived, during Niger's Cure Salée festival, a yearly gathering of the Tuareg and Wodaabe nomadic peoples. McDonald's team and their partners were able to vaccinate 20,000 head of cattle for diseases that otherwise might wipe out the groups' livestock. "We wanted to take the message that we’re here not only for security, but actually to help them out with their livelihood," McDonald said. The team has also been able to help out in local schools. "It’s not the lack of education, it’s more the lack of materials," he said. 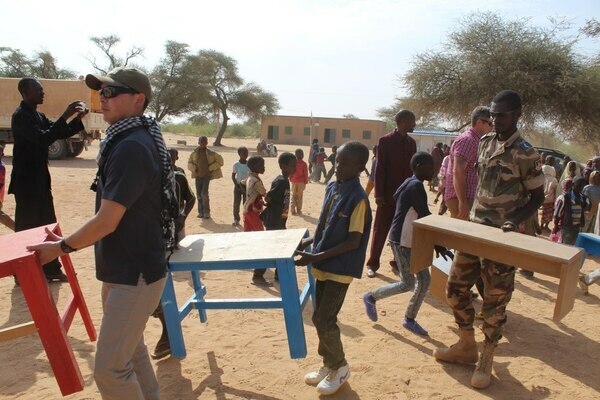 U.S. soldiers and airmen work hand in hand with students, administrators and the Nigerienne Armed Forces Actions Civil Militaire to move desks and benches into classrooms at the Tchifeugen School in Niger, Jan. 17, 2017. Members of the U.S. Army Civil Affairs Team 8241, the 724th Expeditionary Air Base Squadron and 31st Expeditionary Red Horse Squadron donated the desks and conducted the engagement alongside their Nigerienne counterparts as part of the ongoing effort to reduce Boko Haram's ability to recruit and influence vulnerable populations in the Lake Chad Basin. On site visits, the team noticed that in classrooms of 100 or more students, half would be sitting on the floor, completely distracted because they didn't have their own work spaces. So the team rounded up desks and benches donated by American service members deployed to the area to equip the schools, McDonald said. "The reason why we really are targeting that young population is because they could become susceptible to [violent extremist organization] messaging over time," he added. Fifty percent of Niger's population is under 18, he said, and 75 percent are under 25. "When you think about lack of employment, lack of infrastructure, lack of governance — when you invest in education, you’re actually investing in the Agadez region, in Niger, in the long term, to help them counter that type of messaging," he said. Officials didn't have a timeline for the civil affairs mission, but emphasized that the ultimate plan is up to the State Department. "The U.S. isn’t the solution, but we’re just a partner to help them identify the solution as they move forward, in the long term," McDonald said. There are 2.3 million displaced people in the Lake Chad Basin, Zinno added, and changes in climate as well as ongoing war have created food insecurity. "We are working with Africans as they are rising themselves. There’s still development here in Niger," he said. 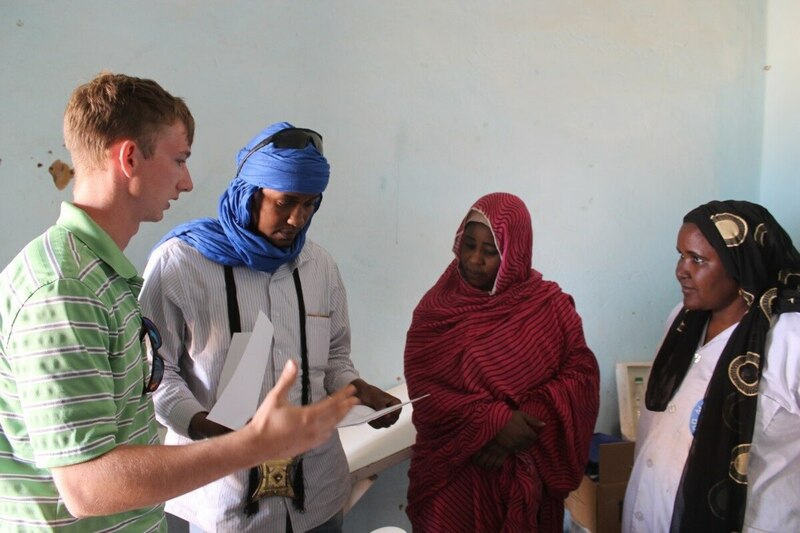 "There’s potential here in Agadez, not just with the people themselves but with the infrastructure as well. Securing their stability secures our stability worldwide."